Sturdy and innovative design with high quality craftsmanship, this grinder is a Cannador favorite. This grinder is unlike other grinders because it finely chops your flower into even pieces for an even burn. 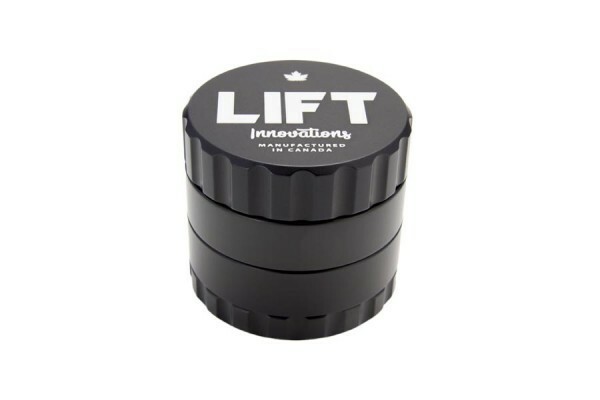 Unlike traditional grinders that smash the flower into uneven chunks, this grinder effortlessly and smoothly chops the flower with a quarter turn, making it a simple process. No more having grind endlessly and then check to see if the flower is ground. The bottom kief catch has rounded edges and comes with a pick to easily scoop out kief. This grinder is extremely easy to clean and can be disassembled to clean out the blade and grate. We also like this grinder because it's made in Canada!